A NEWLY launched Bike Boat, which provides a special ferry service for cyclists across England's longest lake, will go daily for the school summer holidays. 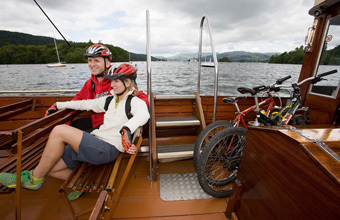 Windermere Lake Cruises has specially adapted a traditional wooden vessel, Sunflower, to carry up to 12 bikes and passengers across the lake and back. Running approximately every 20 minutes, it will act as a ferry service for cyclists travelling between Brockhole, the Lake District Visitor Centre, on the eastern side of the lake and Wray, on Windermere's tranquil western shore. Managing director of Windermere Lake Cruises Nigel Wilkinson said: "The Bike Boat is a completely new service for the Lake District and England's largest lake. With weekend crossings already underway and 10 daily crossings each way through the summer holidays, it's a convenient way to connect families and their bikes with safer, traffic free routes as part of the ever-developing bike network on Windermere's western shore."